Toyota has revealed its new Supra at the Detroit Auto Show - with orders now open and prices set to start at £52,695 in the UK. Officially badged the GR Supra (GR stands for Gazoo Racing, Toyota's race team), the new sports car shares its platform and factory with the latest BMW Z4. Powered by a 3.0-litre turbocharged six-cylinder petrol engine producing a hefty 340PS and 500Nm of torque, the new Supra will cover 0-62mph in 4.3 seconds and have a limited top speed of 155mph. Fuel consumption figures are yet to be announced. All models will come with an eight-speed automatic gearbox, while keen drivers can take control using paddles mounted behind the steering wheel. It’ll be a strict two seater, and these new images show what appears to be a rather slick cabin. The low, slim dashboard is said to improve forward visibility for the driver, while an 8.8-inch multimedia screen can be operated by touch or using a rotary controller. Toyota says the boot space is large enough for two people’s luggage for a weekend away and can be extended with a removable panel at the back of the cabin, creating enough room for a golf bag. At launch, buyers will choose between two trim levels: the standard Supra 3.0L and the Supra 3.0L Pro. Priced from £52,695, the standard car features navigation, adaptive cruise control and the Supra Safety+ package, incorporating intelligent parking sensors with automatic braking as well a rear-cross traffic alert and other useful safety features. It also comes with an active differential, adaptive suspension and 19-inch alloy wheels with high performance brakes, as well as rain-sensing wipers and a rear-view camera. The standard sports seats are upholstered in black Alcantara and are power-adjustable (including lumbar support), with integrated heating and memory functions. The majority of UK sales are expected to be the Supra 3.0L Pro grade, which costs £54,000 and adds black leather seats, a 12-speaker JBL premium sound system, head-up display, wireless mobile phone charger and storage and lighting packs. A limited run of 24 Supra 3.0L A90 Edition models will be sold in the UK. This is priced at £56,945 and features a matt grey paint finish, along with matt black alloy wheels and an interior finished in red leather. This will be offered to UK customers who have already placed a pre-sales reservation. 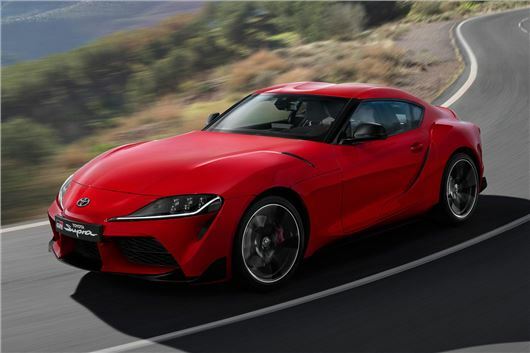 The 2019 Toyota Supra is on sale now. For a type of car that needs to look good as well as go great, this, to me, misses the mark. Whilst not as retro 80s interior (ugh) as its little brother the GT 86, it still isn't that stylish, and the exterior looks too much like a collection of swooping curves in random places. Not my cup-of-tea. Toyota still have a way to go on the styling front to catch up with the best in the business. It looks very BMW. Not a good thing in my book.